It’s a new era. It’s a new world. New standards. We think differently, we live differently, we indulge in different things. Yet there is one dessert that never goes out of style—ice cream. dërinice is the new twist on a timeless childhood pleasure, with all new standards for desserts! 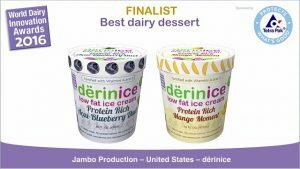 dërinice low -fat ice cream is a high protein dairy dessert, fortified with vitamins A and D3, milk protein, organic prebiotic fiber and fewer calories. Our product offers great taste without added sugar or artificial flavors. 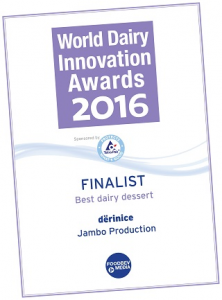 We truly believe dërinice is the best dairy dessert because we have improved this favorite treat to fit our diets, eating habits and busy schedules. We carefully handpicked the ingredients and cooked our dairy dessert, so that we could feel more than satisfied about the quality of the product, and feel good about ourselves. One of the reasons we fortify our desserts with vitamins is because we want people to feel good, while indulging in our delicious product! dërinice is the Best Dairy Dessert. We are proud to present the world a new delicious ice cream made with new era standards. 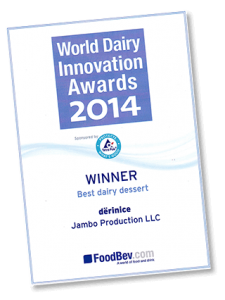 We are proud innovators of dairy desserts! Redefine your dessert, evolve your pleasure.